This is the continuation of my poem. Yes, I wrote it myself, though it is based on Hardy's novel. I have striven to adopt Victorian mannerisms in my writing, which is why it may sound old-fashioned. This is based on Chapter 2. If you're confused, Tess lives in a village called Marlott, which is I believe in a district called Blakemoor, which is in Dorset. If you don't know, just check the book. And nightingales begin to hum. 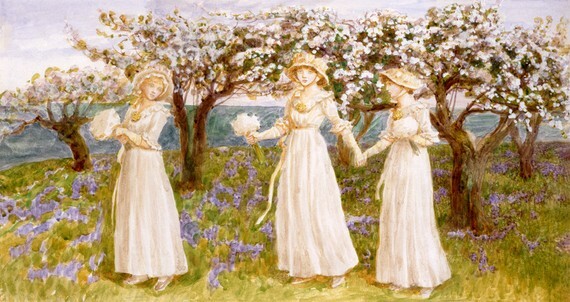 And dance like fairies in a ring. "I've got a noble vault!" he cries. With fire in her changing/melting/smouldered eyes./ Fire in many-shaded eyes. "Tess Durbeyfield, it's thy father!" They see her wrath and cease their blather. She turns her gaze to realms/sights/lands afar. But none is fair in every way. With rose-blown cheeks, and rounded arm. Ripe years have not plucked out/unplucked the child. The violets taken up at last. Had wove around their May-day charms. Smoke towers up into the sky. And longing looks at their terrain/ sets his gaze on their terrain./ He gazes at the grassy plain. His brothers urge him to depart. He says, "Go on. You need not wait. Over the wooden fence he climbs. Author's note: This is not meant to be anti-atheist. I am in fact an atheist. The character of the curate is such that he wants to read a Counterblast to Agnosticism at home. 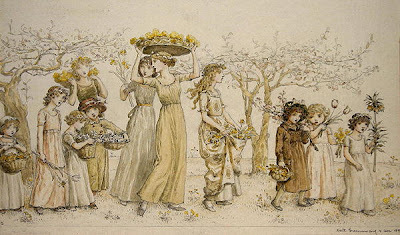 Illustrations are by Kate Greenaway, a prominent Victorian illustrator. 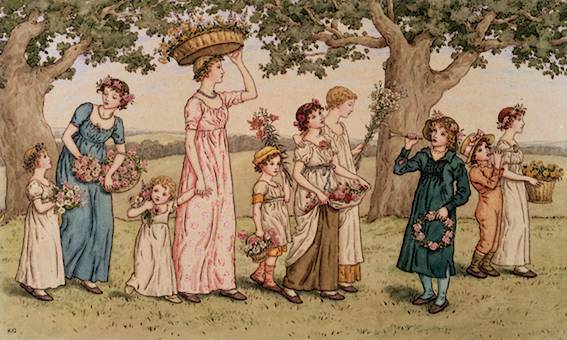 She illustrated Robert Browning's Pied Piper of Hamelin, so the Victorians were actually more accepting of women's careers more than we like to think. Not doubting once thy /your perfidy. Now this would be interesting lines, though I've no idea how to start from there. Sorry it's taken me forever to come over and read this (and the first poem), but I wanted to do it justice, rather than the quick reads I've been doing lately. I haven't read "Tess" yet, but you've got me more interested than ever. I'll admit I'm a little scared because it's probably going to be tempestuously romantic and depressing, but I appreciated the hints of humor in part 1. I also didn't know about Kate Greenaway. So did you submit this to the competition? I don't really have suggestions at the moment, except my preference in v is "some part their lips to sing". I see you have a chatbox. Do we have to both be online at the same time to use it? I'll also give you my email address over at my blog, if you like the idea of chatting that way. As it turned out, I ran out of inspiration and couldn't meet the criteria for the competition (at least 150 lines). So I didn't submit it. I think you don't have to be online at the same time to use the chatbox. I think it's better we exchange email addresses, it's more personal, instead of letting the whole world see our nerdy rants.